Shinn Estate Farmhouse is located on the estate of Barbara and David Shinn, owners and vintners of the property. With four guest rooms to select from, Shinn Estate Farmhouse is located in Mattituck, NY, in the center of the farming belt and affords stunning vineyard views to those who visit. Guests enjoy the relaxing quiet of the country atmosphere while surrounded by the elegance of the award winning winery. What makes this location stand out is the extra care the owners have taken to connect with the surrounding earth on an intrinsic level. 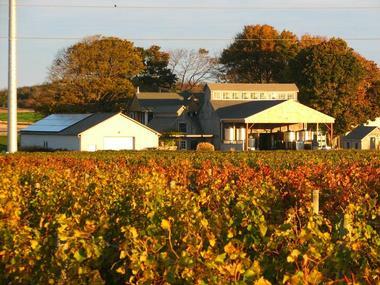 The vineyard, set on 20 acres, became the first winery to be powered entirely by alternative energy in 2010, with the installation of solar panels and wind power systems. This is an excellent location for those seeking to connect with nature in a holistic, relaxing atmosphere without sacrificing the glamor and pampering that comes with staying at this elite bed and breakfast. Each of the four guest rooms at Shinn Estate Farmhouse has something unique to offer. With cotton linens and feather pillows on queen-sized beds, guests can wake refreshed for the day and savor the complimentary breakfast each morning. Large windows offer spectacular views, and the roomy bathrooms come with organic soaps and complimentary robes and slippers. Rooms also boast flat screen televisions and wireless Internet access. Porchside, so called because of its stunning wrap-around porch, allows for ease and convenience with a roomy bathroom, walk-in shower, and full wheelchair accessibility. 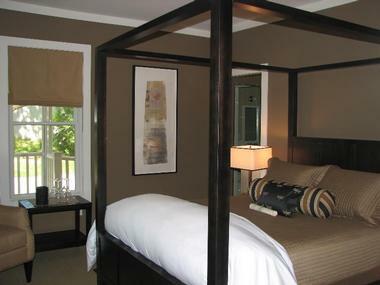 This room contains a four-poster queen-sized bed and a spectacular window view of the northern farm fields. North Field is a welcoming sunny room that also offers a view of the northern farm field. This room contains a four-poster queen-sized bed, in-room climate control, and two farmhouse windows that offer a perfect vista of the sunset over the dappled fields. The bathroom, the largest in the house, is located across the hall. Tree House provides guests with a roofline view of the winery as they enjoy a glass of in-house wine. Overlooking the 60-acre potato fields, this room is perfect for downtime with its queen-sized bed and in suite bathroom. The atmosphere is one of cozy playfulness in this second floor suite, which is well known for its view of the picturesque moonrise during October and November. Vineyard West offers a view overlooking the vineyards themselves, with a gorgeous view no matter what time of year guests visit. For example, guests have the opportunity to see the vines budding in the spring or wonder at the fall harvest. This room contains a queen-sized bed, lounging chair, and in suite bathroom as well as all provided amenities. Since the property is small, each reservation is treated with the utmost care. Arriving guests are asked to pay in full and if cancellation is necessary to give at least 14 days notice with the application of a 10% processing fee. If unable to do so guests will be charged the full rate unless the room can be rebooked, in which case a full or partial refund can be expected. Check-in takes place between 3 pm and 5 pm unless special arrangements have been made. Check out is at 11 am. Rooms are non-smoking and pet free, and children ages 14 and older are welcome. For an additional small charge both flowers and a chocolate box can be added to a reservation. Sitting on the land since the 1880's, the homestead received a full renovation and restoration in 2007. Given a modern face-lift but keeping the mood of the historic farmhouse setting, the homestead offers welcoming comfort that cannot be compared. Maple trees and gardens create the perfect place for guests to stroll, and the organic garden provides for the complimentary breakfast, adding to the philosophy of sustainability. Guests can enjoy the vineyards at their convenience or join in the planned vineyard walks on weekends at 1:30 pm, led by owner Barbara Shinn. Guests can mingle and enjoy the fruits of the vineyards in the Tasting room. Sustainably made wines include chardonnay, rose, sauvignon blanc, merlot, cabernet franc, and cabernet sauvignon, and guests can enjoy complimentary tastings. Those staying over the weekend can enjoy a guided tour through the Vineyard Walk, Winery, and Barrel Cellar. Self-guided tours are available during the week. For those who enjoy a more challenging hike or bicycle journey, Oregon Road offers a five-mile trail through the fields of North Fork. The Gazebo and indoor reception area are also available for guests to relax and mingle. In keeping with the owner's philosophy, the on-site menu contains locally grown and sustainable ingredients. Breakfast is included with every reservation and is served each morning between 8 am and 10 pm in the Breakfast Room. Guests are invited to help themselves to the provided fare, which includes freshly brewed organic coffee, tea, juices, homemade granola, scones, organic eggs from on-site chickens, local artisan breads, and organic yogurt. 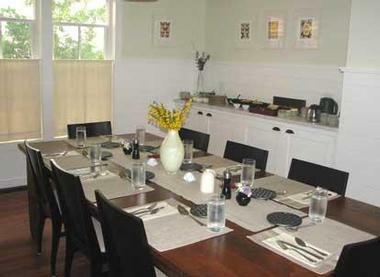 The room reservation also includes homemade cookies, wine, and cheese in the living room between 3:30 pm and 6 pm, as well as access to the tasting room. Hotel staff is happy to assist in finding nearby restaurants for dinners out. Shinn Estate Vineyards and Farmhouse provides the perfect setting for those seeking an intimate locale for a wedding. With 22 acres of vines and historic barns on the property, there are many choices to create the perfect atmosphere for your special day. The location can accommodate up to 40 guests for weddings, rehearsal dinners, engagement parties, or other celebratory occasions. Having corporate events, holiday parties, or anniversary dinners here are just a few of the ways to enjoy the magical atmosphere. Breakfast, cheese platters, and beverage service are available upon request. The philosophy behind the care and management of the vineyard has made it one of the most sustainable event locations on the East Coast. Barbara Shinn and David Page take an immense amount of pride in connecting with the surrounding nature, and they invite the guests to do the same. After purchasing the estate in 1998, they knew their goal was to reconnect with nature. 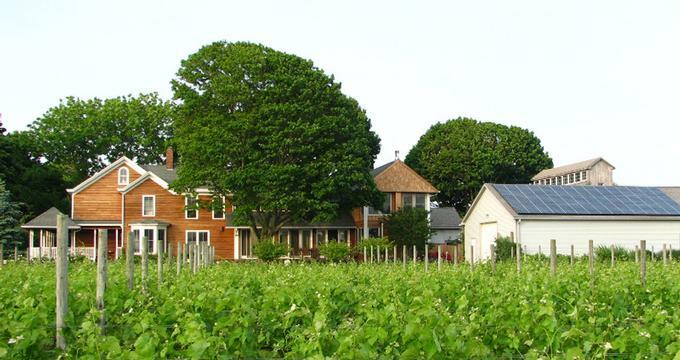 The Tuthill homestead in Mattituck, New York allowed them space to plant 20 acres of grapevines for the purpose of building an estate winery and bed and breakfast. It has since been named one of the top wine destinations in the country. In 2010, solar and wind power were added to the estate, which propelled them to become the first on the East Coast to be powered by alternative energy. 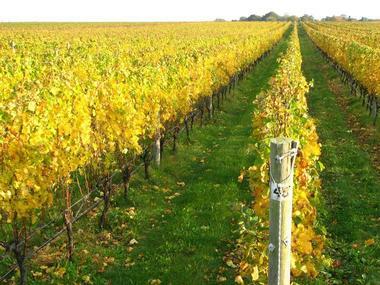 The vineyard and gardens are kept by using holistic farming techniques, utilizing nature's own systems such as beneficial insects and biodynamic growing techniques. Guests are invited to learn about these practices with the available tours, which include self-guided and guided on the weekends. It should be noted that young adults and children age 14 and older are welcome with an accompanying non-drinking adult parent. The Wine Library and Barrel Cellar are yet another surprise for guests seeking to enrich their knowledge of holistic spirit making. Tours are available every Saturday and Sunday at 2:30 pm allowing patrons to witness first hand the barrel aging techniques. Delicious wines are poured after the tour, and the cost is $25 for six or more guests. The Wine Library is exactly as it sounds: a room encasing a variety of vintage bottles set aside for special aging. The atmosphere is cozy with wooden tables, lavish chairs, and marble counters. Artisan cheese platters can be added with private reservations for this room or combination of wine tastings at varying costs depending on guest choice. For those who wish to experience everything the estate has to offer, the Full Experience tour can be purchased. Beginning with a guided tour by Barbara Shinn, guests can learn about the sustainability practiced on-site, biodynamic winegrowing, and the philosophy of the owners. A private tasting at the Barrel Cellar follows as guests are introduced to the gravity fed cellar. The tour then circles back to the tasting room, allowing guests to taste a selection of the current wines. The tour lasts about 2 hours, at $75 per person with a minimum charge of $300. Cancellations should be given with 24-hour notice. The estate has been named as one of the top destinations for wine lovers by multiple magazines, and it is utterly unique in its philosophy. The sacredness of nature is something the owners stand by and respect in the sustainability of their winemaking and business structure. Anyone who steps into such an atmosphere would surely feel the same. Rooms start at $169 per night.